The Amazon Associates Link Builder WordPress plug-in can help you integrate Amazon products into your site in an easy and attractive way, with just a few clicks. The Link Builder is a free, official WordPress plug-in that is designed to make it easy for Amazon Associates members to search for Amazon products to include on your site. With the plug-in, you can link directly to those products – all with just a few clicks, and without having to leave your WordPress Editor. Using the Amazon Associates Link Builder means you don’t have to manually integrate important product information, such as product names, descriptions and preview images. 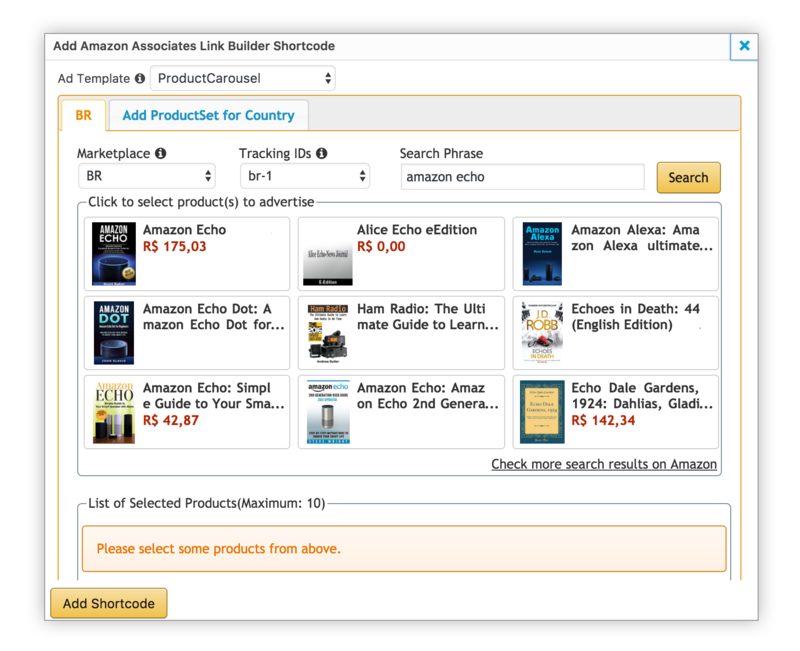 Instead, the Link Builder plug-in generates shortcodes, which you use to select Amazon product data in different display formats and then output on your own website. Register in the appropriate marketplace Amazon Associates program Depending on which countries you have international traffic from, you should ensure that you have registered as an Amazon Associates, and created store-ids or tracking ids in each of your accounts. Note that AALB does not validate the tracking ids entered, so please make sure that the correct tracking ids as configured in the respective country Associates Central portal are added to your configuration, else you might lose attribution and revenue. Additionally, make sure that accurate PA API credentials are configured in the PA API credentials section. These credentials should be linked to the same accounts as the tracking ids configured for your site. 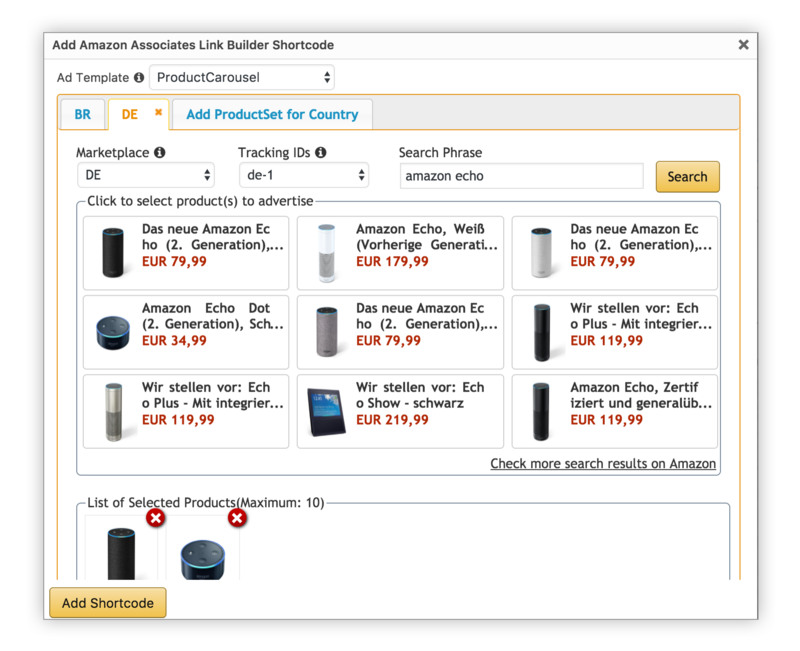 Once all the settings have been configured correctly, the Amazon Search box and button should be enabled on your Add New Post page. Select the Ad Template to use to display the selected products in. Please note that the same ad template will be used to display products in all countries. However, the actual products that we display will be targeted to the traffic spouce of the visitors to your site. 1. What versions of WordPress does the plugin work with? The plugin is compatible with v3.0.1 up to v4.9. 2. I have accounts with several Amazon Associates Programs (in different locales). Will the plugin work for me? Yes! You can use the same plugin across all the locales in which you have an Associates account. Use the settings within the plugin to indicate which locales you have signed up for and their tracking IDs. From that point, you’re all set. 3. During setup, I’m being asked for various “keys”. What are these and how do I get them? The Link Builder plugin leverages our Product Advertising API and the API requires access credentials, aka keys, specific to your Amazon account in order to function. Visit it to sign up for API access or to get your keys. A detailed description of the Product Advertising API is available here. 4. The plugin update changelog is asking me to back up custom templates that I created. How do I do that? Instructions for backing up your custom templates can be found here. This is solely due to security reasons. Users who have already updated the plugin did not experience any changes to the templates. 5. How do I delete the plugin? In your plugin overview, first deactivate the plugin. Then check if your website is still fully functioning. After deactivating the plugin, you can delete it from the plugin overview or delete the folder “amazon-associates-link-builder” in the path content/plugins on your server. 6. How do I access my earnings and other reports? You can see your earnings and other reports from the respective country Associates Portal. 1. How will the geo-targeting feature benefit me? The geo-targeting feature lets you monetize any traffic from other countries that was harder to monetize earlier. In accordance with our Operating Agreement, attribution to Amazon links placed on your site does not hold if the end user has to switch to a different country specific website to complete his/her purchase. Similarly, if you send users to the correct country website, but with an incorrect country’s tracking id (not valid in that locale), then you will not get paid the affiliate fees for that sale. Many Associates use complex home-grown systems, or unreliable 3rd party systems to overcome these limitations. These systems might have trust, reliability and pricing implications on your business. The geo-targeting feature in the WordPress plugin aims to reduce this complexity and give you more control on your monetization of global traffic. 2. How do I use the geo-targeting feature in the plugin? As a part of the global settings in the plugin, you can configure which countries you want to work with, and the respective tracking id(s). You will also need to provide a set of PA API credentials, which are connected to each of your respective country associate accounts. You will only need to do this once. As you create content, you will see a tabbed pane which lets you select product sets for each country that you have configured in the plugin. You should pick your default country as the first product set configured. The corresponding short code that is generated will have all the information required to render ads appropriately. When a user visits your site, we use the user’s location to determine which of the product sets to display to the user, and the corresponding ads are rendered. If the user is from a location that you haven’t configured, then your default product set is displayed to the user. 3. Why should I go through the effort of picking out products in every country? Can’t Amazon pick out products in every country automatically? Amazon Associates also has the OneLink program through which you can have Amazon replace your links with redirected links which will take the user to the correct Amazon marketplace. If you only use text links, then this might be a suitable solution. This does not change the content on your page (i.e. product title, display image, price etc. ).